Feathers - Visual Dictionary - Copyright © 2005-2016 - All rights reserved. [img]https://infovisual.info//storage/app/media/02/img_en/058 Feathers.jpg[/img] [url=https://infovisual.info/en][/url] - [url=http://www.infovisual.info/]Visual Dictionary[/url] - Copyright © 2005-2016 - All rights reserved. 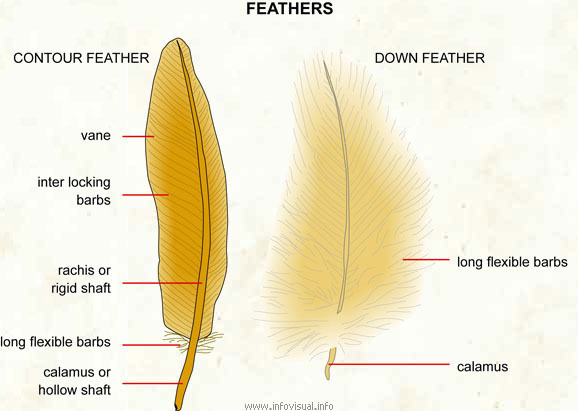 Feathers: organ composed of a supple shaft with barbs and barbules. The feathers cover the body of the bird, protecting it and maintaining its body temperature. Down feather: the soft, first feathers that grow on a bird. Long flexible barbs: filaments of down feathers, which are not attached to each other. Calamus: the shaft of the feather. Calamus or hollow shaft: hollow quill of the feather. Rachis or rigid shaft: solid part of the shaft. Inter locking barbs: filaments of the feather that are not soft and free. Vane: thin flat part of the feather. Contour feather: one of the largest feather on the edge of a bird's wing. Feathers are one of the epidermal growths that form the distinctive outer covering, or plumage, on birds. They are the outstanding characteristic that distinguishes the Class Aves from all other living groups. Other Theropoda also had feathers. Feathers are grouped into feather-tracts. Feathers are among the most complex structural organs found in vertebrates: integumentary appendages, formed by controlled proliferation of cells in the epidermis, or outer skin layer, that produce keratin proteins. The ß-keratins in feathers, beaks and claws and the claws, scales and shells of reptiles are composed of protein strands hydrogen-bonded into ß-pleated sheets, which are then further twisted and crosslinked by disulfide bridges into structures even tougher than the a-keratins of mammalian hair, horns and hoof. Feathers insulate birds from water and cold temperatures. The individual feathers in the wings and tail play important roles in controlling flight. These have their own identity and are not just randomly distributed. Some species have a crest of feathers on their heads. Although feathers are light, a bird's plumage weighs two or three times more than its skeleton of a bird, since many bones are hollow and contain air sacs. Color patterns serve as camouflage against predators for birds in their habitats, and by predators looking for a meal. As with fish, the top and bottom colors may be different to provide camouflage during flight. Striking differences in feather patterns and colors are part of the sexual dimorphism of many bird species and are particularly important in selection of mating pairs. The remarkable colors and feather sizes of some species have never been fully explained.